This photo was taken on December 18, 2012 at 3:26 PM. The location was in a great hotel in Crystal City, Virginia. The "Take It!" came as I was slowly walking across the lobby of this wonderful hotel. I was doing my usual look down routine as I watch my steps carefully, and saw this wonderful reflection in the well polished marble on the floor. 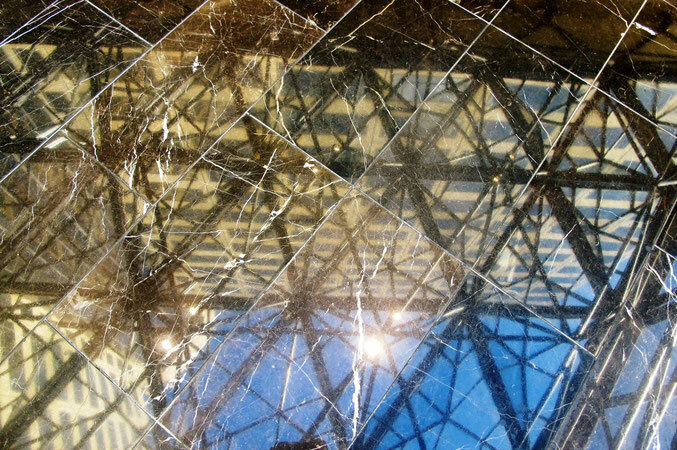 One can readily see as I did, the grid of the marble squares on the floor, Next is the grid of the framing of the windows in the skylight over the atrium. Next is to see through the windows and look at the surrounding walls of the building. Finally, one can see the blue sky and the sun ( which, with its intensity, made all of this shot possible ). This was truly a stop in my tracks moment. The After Take: Everyone wanted to know where the photo was taken. Without exception they thought it was cool. A few pointed out the contribution the grain in the marble made to the picture. Again, my gratitude to those who help me see my photos by sharing their views on how they view them. Here again, I offer the suggestion to "watch your step" perhaps not as much as I do - but please include this view, as it may pleasantly surprise you. That is a really intense picture. It took me a second to process what I was looking at. I looked at the image before looking that the title or reading. Yeah, wow what a powerful picture. Intense, almost had to squint. I really appreciate this photo. Very nice.